The Northeast region of the United States accounts for over 2% of the world’s annual oil consumption, but remains one of the only major regions in the country not served by a direct pipeline to move refined products, including gasoline and home-heating oil, from refining centers to consumers. As a result, needed refined products from the Gulf Coast and other refining areas must be transported through a logistically difficult and time-consuming process in which they are first shipped through the New York Harbor area, then carried up the Hudson River to northern terminals by barge, and, finally, brought inland to consumers via truck. 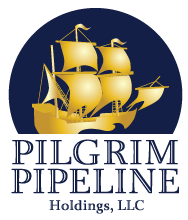 The Pilgrim Pipeline will boost economic growth and job creation in the region and provide a more stable and reliable transportation system for the delivery of petroleum products. Addressing consumer wait times currently caused by the relatively small size of barges transporting product via the Hudson River. Delivering refined petroleum products to existing terminals in New York at a more-than-competitive rate. Allowing additional standby transportation capacity to be available to handle any increased demand surges. Creating jobs for those involved in the construction of facilities and the operation and maintenance of the pipeline system. Streamlining the transportation and delivery processes and increase the quantity of fuel available to consumers, all while providing significant transportation savings.